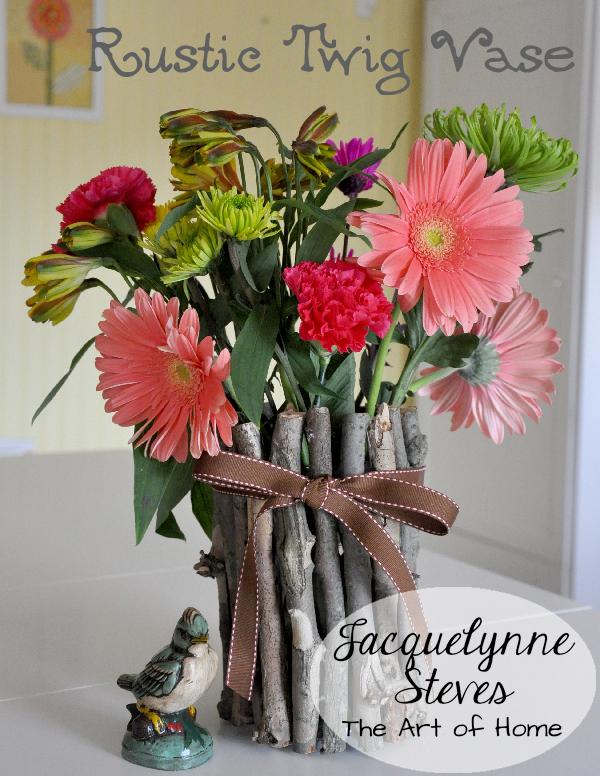 This Rustic Twig Vase is one of my favorite projects! I love the rustic and natural look of this vase. It is a great way to bring a little bit of the outdoors inside and you can change out the ribbon and the flowers according to the season. This is practically a no-cost project! I had this vase in the back of the closet, it was one of those cheap vases included in florist’s arrangements. The twigs were found in the backyard. 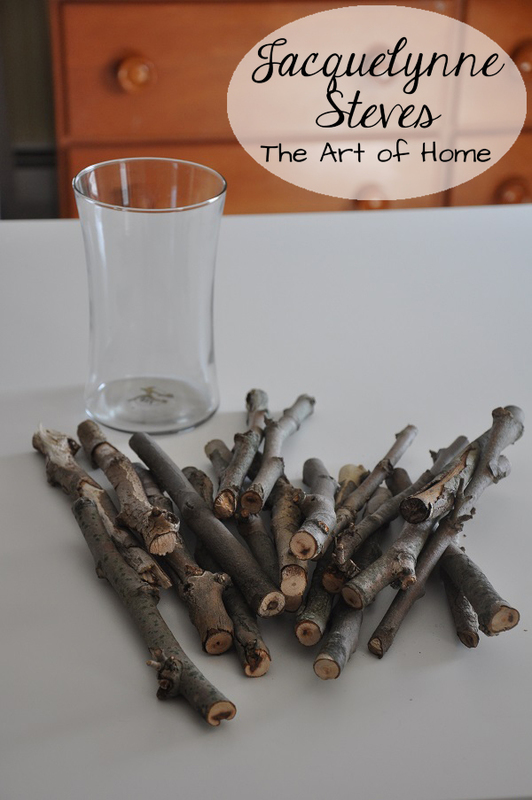 It took me about 90 minutes total to collect and cut the twigs and assemble the vase. Wouldn’t this be so cute on your dining table, buffet or even your mantel? Decide how tall you you need your twigs to be. They should be about 1” longer than the height of your vase. Use the Sharpie marker to mark the twig where it needs to be cut. Cut twigs to the correct length. Apply glue to top and bottom edges of vase. Don’t cover the entire edge at once; apply enough glue for just one twig at a time. Glue on twigs. Tie ribbon to top of vase. 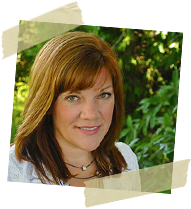 Click here for a printable PDF of this project. This article was posted in Crafts & DIY, Featured, Garden & Outdoor, Spring. Bookmark the permalink. Follow comments with the RSS feed for this post.Post a Comment or leave a trackback: Trackback URL. What a super idea. Jacquelynne I think your little yellow blooms are what we in the UK call aconites. We also have places to go for snowdrop walks to see the early ones blooming. 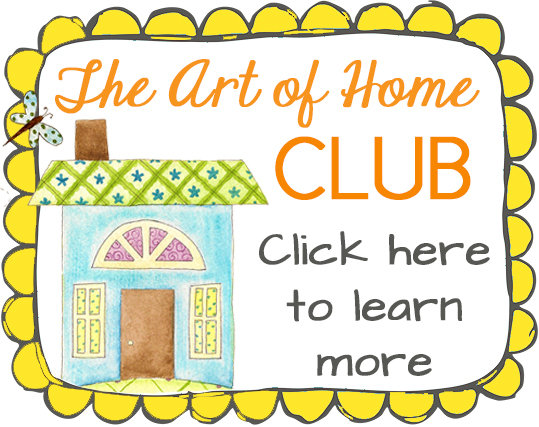 I absolutely love getting all the news from the Art of Home Club and for me a real treat is watching you on You Tube. Love and best wishes to you. Your very lucky to be able to see the flowers. We are still under snow right now. Of course we live in Winnipeg Manitoba, Canada so a little further north. Looking forward to seeing the new flowers come out. Thank you for sharing. I am going to make your vase and maybe a few to share so I can put the flowers in. Empty jars work also. When you use a vase do you use plastic or glass? When I glue on glass I use E2000 glue.